Henry Barrow and John Greenwood are the fathers of Elizabethan Separatism. Unlike Robert Browne, they refused to compromise their beliefs or conform to Anglicanism and as a consequence they died in 1593 - as martyrs for their steadfast adherence to the principles of English Congregationalism. 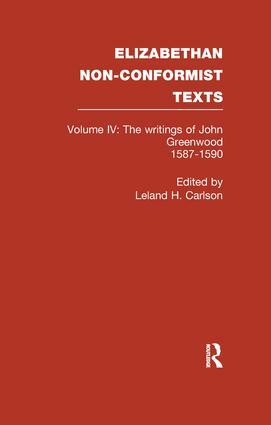 Volumes three and four include c. 40 items derived from manuscripts, surreptitiously printed books and very rare pamphlets and documents which allow evaluation of the teachings of the Separatists, in relation to the activities of the Elizabethan hierarchy, to the Puritans, to the Pilgrims in the Netherlands and the New World and to the Independents and Congregationalists. (16 of the pieces are by Barrow, 6 by Greenwood and 5 by both men, in addition to 13 related Barrowist items in the Appendix).